It’s almost one of my favourite times of the year, the Melbourne International Comedy Festival. Before the festival hits full swing, Melbourne is sending its favourite kids’ comedy acts northwards to warm up the laughs in Sydney and Brisbane. Kids comedy duo The Listies (also known as The List Operators) bring their brand new show, The Listies in 6D* (that’s twice as good as 3D), to the Sydney Opera House and Brisbane Powerhouse these school holidays. My kids are long time fans of The Listies (who are Matt Kelly and Richard Higgins). According to my seven-year-old, the Listies have “…the right number of poo jokes.” Don’t ask me what that number is, but know that in the world of kids, The Listies are big-time funny. The Listies in 6D* promises to be a million times better than the best movie you’ve seen! The duo explores the exciting world of cinema with some behind-the-scenes glimpses of what happens on a movie set. Of course, the show also promises to be raucous, a bit cheeky and may contain a fart joke or two. The Listies in 6D* is part of the Sydney Opera House Kids at the House program and runs from 16 – 28 April, 2013. The show is suitable for children aged five years and over. Tickets are $30 and can be booked online at the Sydney Opera House. 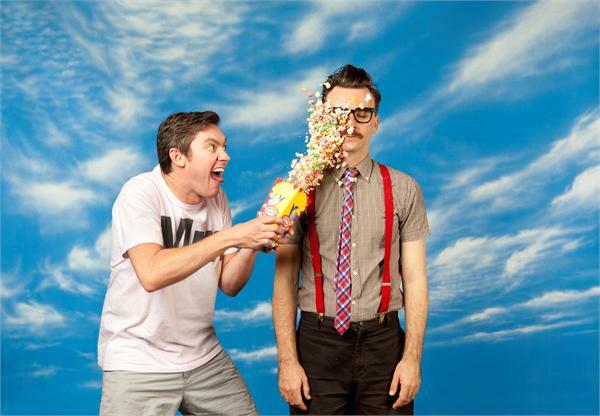 The Listies will also play Brisbane from 3-6 April while Melbourne kids can laugh themselves sick from April 9 – 13, 2013. More details on these shows are available on The Listies’ website.